Description of a wine aging in relatively small wooden barrels, which are also roasted (toned) compared to conventional wooden barrels on the inner walls by firing. It is therefore a special form of the aging in oak barrels with the aim of introducing wood and roasted flavors into the wine. Through the Barriqueausbau thus reach diverse flavorings additionally in the wine. The name derives from Barrique, in the Bordeaux mainly used barrel type with the standard volume of 225 liters. 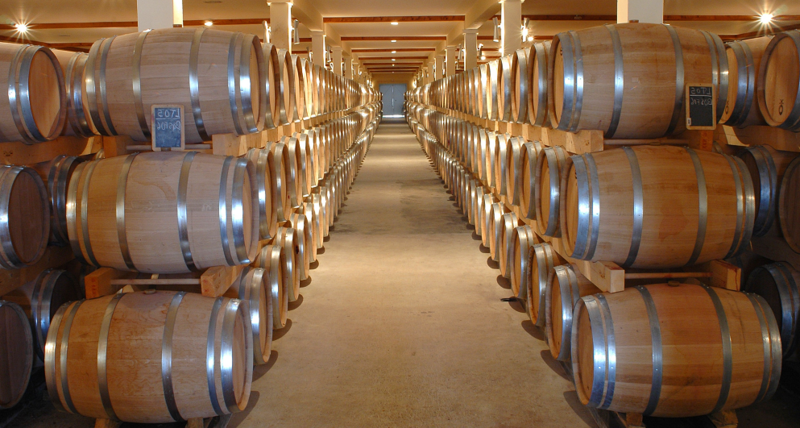 As barrique barrel, however, also larger barrels are considered, in extreme cases up to 700 liters. Up to which barrel size one can speak of a "real" Barrique expansion, however, is regulated differently country-specific. As a rule, the barrels are off Oak wood Special oak trees mainly from France and America (and also native oaks), but also other types of wood such as acacia or chestnut. The French have been using this procedure for more than 200 years. One of the first is Louis-Gaspard d'Estournel (1753-1844), owner of the Château Cos d'Estournel, At the beginning of the 19th century, he learned that some unsold and returned wine portions had improved their taste after the return transport. He decided to transport all his wines before selling in wooden barrels. This was also favored by the English as customers of Bordeaux wines. They noticed that the wine transported in the barrel was more durable and demanded this quality. Another popularization was carried out by the transport to the German Hanseatic cities of Bremen, Hamburg and Lübeck, to which the Bordeaux wine as so-called Rotspon was delivered. Winemakers from Bordeaux who visited their Hanseatic customers did not recognize their own wines due to positive changes. Only later was that toasting common, that is, to roast the barrels inside and thus produce additional flavors. Worldwide, the Barrique expansion came on a large scale but only from the 1970s in fashion. The barrique wines are matured in these small barrels for a long time, that is mature. Already by using a barrel once loses this up to 85% of its aromas. A barrique barrel can therefore only be used two to three times, which makes wine making much more expensive. If only new oak barrels are used for the expansion, this is called "100%". At "50%", 50% is ripened in new and 50% in once-used barrels. After that takes place leveling (Mixing) the barrels. It gives the bandwidth between "20%" to "100%". Some producers even grow in "200%" (eg Château Valandraud ). This means that the wine is transferred from a new barrel to another new barrel. The extent or intensity of the "wood tone" ( toast flavor ) depends on consumer taste, the trend is towards "less". The French oenologist Émile Peynaud (1912-2004) said: "You have to use the wood in the wines as the spice herbs in the fine kitchen: It must bring the other flavors to even better advantage." Predestined for a Barrique expansion are the Rotwqeinsorten Cabernet Franc. Cabernet Sauvignon. Merlot. Nebbiolo. Pinot Noir. Sangiovese. Syrah (Shiraz) and Tempranillo, as well as the white wine varieties Chardonnay. Macabeo. Sauvignon Blanc. Sémillon and Viognier, When maturing in the barrel, an interaction between the tannins contained in the wine and the aromatic substances of the oak as eugenol. furfural. tannin. terpene and vanillin, Depending on the type of wood used, the type of woodcut produced in the wine is the same staves and especially the intensity of the toasting (Fasseinbrand) a typical taste tone after caramel. coffee and toast; the wine will be there sensory changed significantly. With increasing age of the wine this taste decreases in the course of the bottle aging or. aging again. Barrique wines must necessarily the malolactic fermentation go through to the malic acid dismantle. The storage time depends on the desired intensity of the wood tone, which depends essentially on the age of the barrel. Regular control by tasting is important because red wines contribute to the formation of acetic acid tend (see also under Acetobacter ). During aging of the barrique, which takes at least 6 for red wines, usually 12 to 24 months (but sometimes up to 48 months in extreme cases), and for white wines usually less, the wine is from time to time transferred to another barrel, carefully ventilated while separating from the sediment (frz.lie). The aging in barriques is complex and costly. A barrel costs between € 350 (American) to € 550 (French). Therefore you try different alternatives (see below). In Germany and Austria, the Barrique expansion was only from the early 1980s popular and sat down for the time being only slowly. Especially in Germany, this was initially associated with great problems, because wines matured in oak barrels were not in accordance with the taste of the provisions of the German wine law. It was forbidden, for example, to pour wine into a container so that its odor and flavor would be transformed into the product (only allowed for the storage of spirits in oak barrels). Therefore, in the award of the official test number in the course of quality wine testing such wines as table wines outclassed. After initial restraint finally took the quality inspection authority under the pressure of the practice but also "barrique wines" for testing. However, the legal basis for this method was still missing. Finally, in 1996, when it was laid down under what conditions the term "matured in barrique" is permissible, the "detour through the designation right" constitutes a factual legal position which also makes production and marketing no longer objectionable. For the purpose of improving the image, special clubs were founded, for example HADES (1986) German Barrique Forum (1991) and Barrique Forum Palatinate (1993). In Austria there was a similar development. The cost commissions initially outclassed the barrique wines as country wine or even table wine, In 1997 it was determined by wine law that only quality wines (only from the year 2018 also land wines) am label may bear the term "barrique" or "matured in the barrique", if in the sensory (organoleptic) test was found that the wine has received "recognizable and harmonious flavors" by storage in oak barrels ". This is hardly used anymore. Whether a wine is aged in barrique, so you can only recognize the taste or price. Overseas, California was the first country where from the 1970s onwards a large number of red wines were tried Bordeaux style manufacture. Both the grape varieties used, as well as the Barrique expansion were imitated, which by French oenologists was supported in an advisory capacity. One of the most famous examples is the one created in 1979 Opus One, From there the process spread very fast over the whole world and almost all big red wines of this world are today in all well-known wine-producing countries expanded in the small oak barrels. From the end of the 1990s, however, the trend returned to the other direction. This is to be understood both to a lesser extent the process itself, and to a greater extent the intensity. Especially in Italy, Germany and Austria efforts are increasingly being made to reduce the long storage times or to expand them to a less tannic extent. Even overseas, this is now increasingly fashionable, which is declared on the label with "unwooded". Among consumers, there are more and more critics who reject an exaggerated use and prefer to rely on fruity, varietal wines. As an alternative to the relatively expensive and time-consuming barrique expansion by means of conventional barrique barrels, there have been alternatives in the New World for a long time. These are Wood chips (small oak pieces) and Staves (Oak slats) and special square containers as an alternative to conventional oak barrels under the brand names rebarriQue and Stakvat, The addition of aromatic oak wood essences to the wine is rather questionable. Within the EU, such techniques have so far only been allowed experimentally by way of exemption. The trade agreement signed between the EU and the EU in 2005 United States there was a liberalization (see under wine law ). Within the EU, the addition to the wine is of oenological tannins (in solid form) and since 2007 also allowed wood chips. There are several methods to extend the useful life of the rule only three times use. The barrels are "refreshed". In Austria Thonhauser offers a so-called reconditioning. The drum is first cleaned with an alkali solution and then rinsed with an acidic solution. The wooden walls are characterized by the Weinstein cleaned, microorganisms eliminated and the wood pores opened. In a procedure of the company Barreco the barrels are milled out with a high-pressure water jet and re-toasted. Some drum manufacturers and carpentry companies offer techniques to remove the used wood surface and re-toast the barrels. In another process, the expansion is done with a combination of used oak barrels and oak chips. Through analyzes and comparisons of all these very new processes by means of tastings of the wines developed in the course of a research work on the Klosterneuburger Weinbauinstitut (Lower Austria) it was found that a restored barrel is not the same as a new barrel. So far, however, there have been no significant differences in wine quality. In any case, these new methods are clearly cheaper. This page was last modified at 30 August 2018 at 16:42.